Keeping a lawn or garden green and growing isn’t as simple as splashing a little water on the grass once in a while. 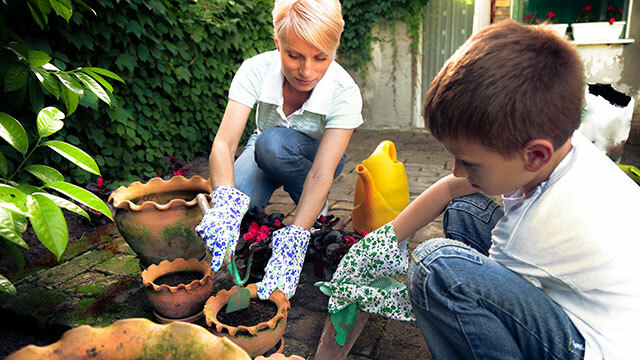 Dedicated home landscapers often find themselves laying down weed covers, mulching, watering, aerating and fertilizing lawns and paying for supplies in addition to expertise and labor. Professional lawn care can cost $100-$200 per month. But instead of shelling out $2,400 a year to keep their backyards looking great, these innovative home gardeners found their own tricks to keep plants lush and happy all year long. Here are five pro tips for landscaping on a budget. Ryan Willis has found doing everything himself when maintaining his 7,500-square-foot yard in Knoxville, Tennessee, is the best way to save money. “The biggest cost savings for me is that I do everything myself — from mowing to seeding, fertilizing, planting flowers, hardscaping, etc.,” he says. Willis administers three treatments to his lawn throughout the year. In early spring, he puts down seed and fertilizer. The tall fescue seed costs $75 and the starter fertilizer with weed preventer is $50, and he uses a broadcast spreader (a one-time $40 expense) to apply them to his lawn. Early in the summer, he adds “weed and feed” fertilizer for about $30, followed by a fall fertilizer application to help roots during the winter (another $30). In addition to fertilizing and other do-it-yourself treatments, GreenPal CEO Bryan Clayton finds another, more innovative way to save money: aerating shoes. “A pair of aerating shoes cost[s] around $50,” he notes. “However, if you wear these while mowing your yard every week in the late summer and early spring, you can save up to $300” versus the cost of paying a professional service. While many enjoy the process of caring for living grass, others may prefer to skip most of the maintenance altogether and opt for artificial turf. Despite the potential for long-term savings, installing an artificial lawn can be a significant upfront expense. The exact price depends on the amount of labor involved, which largely depends on the type of soil, rocks and roots in the area. Purchase Green’s Chad Vander Veen says his company’s artificial grass is generally $1.50 to $3.50 per square foot, but “a typical installation, when looking across California and Nevada, will run between $6-$10/square foot,” including the necessary labor. The national average to install artificial grass is anywhere between $5-$20 per square foot, according to home improvement site HouseLogic, depending on a number of factors. Many homeowners find the low cost of maintenance over time appealing. Vander Veen says once installed, artificial grass doesn’t require nearly as much maintenance as conventional grass. Since artificial lawns don’t need mowing, he explains, you won’t have to pay for a mower or gas, not to mention fertilizer and pesticides. One of the biggest savings is on water. “A $200 per month water bill can be essentially cut in half by eliminating lawn irrigation,” Vander Veen says. However, artificial grass isn’t completely void of maintenance. Owners should rake their lawns once a month with a special broom (around $25). Many also buy a bottle of cleaner to remove stains or pet messes from the lawn. Vander Veen says a gallon bottle, which costs about $40, can clean up to 6,000 square feet. When it comes to your garden and landscaping, plant perennials instead of annuals, suggests Anthony Smith, owner of Nursery Enterprises. These hardier plants survive from year to year and can lead to a smaller plant bill since you won’t need to constantly replace them. “To keep your yard looking sharp on the cheap, instead of continually replacing dead or worn-out annuals, consider switching to woody perennial plants, like bushes, shrubs, vines and trees,” Smith says. Jennifer Patterson Lorenzetti uses flowering herbs and a vegetable garden to keep her yard looking good while also providing a source of food. She calculates she spends around $200-$250 per year on various costs, like plant starts and seeds. However, the retail value of the produce she grows is around $750 per year, so her garden actually saves her about $500 annually. Spending money on unnecessary supplies is one common way to overspend when you’re landscaping on a budget. Buying more than you need — or not enough, which requires extra trips to the store and/or shipping expenses — can rack up your bill. Kurt Heckman’s company, vCalc, sought to find a solution to this common dilemma. The company created an online calculator to help people figure out just how much mulch they’ll need. At most home improvement stores, bags of mulch cost about $3.33 each for 2 cubic feet, according to Heckman. He says bulk mulch is less expensive at $35 per cubic yard. “That’s comparable to $1.54 for a 2-cubic-foot bag, or a little less than half price,” Heckman notes. He also says some jurisdictions require bulk loads of mulch be covered in the back of trucks driving down the road, so be sure to throw a tarp on top to avoid a costly ticket. Finally, Heckman recommends making your own mulch by turning fallen wood into wood chips. “This is noisy and can be dangerous, but it’s also the cheapest source of mulch,” he says. Your Turn: What are your best tips for landscaping on a budget?